‘Accentuate the Positive, Eliminate the Negative….’ Do you know this song? Some say focusing on the positive is the key to happiness. I happen to think it’s a great concept – one that has become my mantra when teaching art and parenting my kids. Having positive self-talk can make a big difference when our kids are learning something new. Take learning to draw- when kids are unhappy with their drawing, it can go one of two ways- they either keep trying or they give up. Wouldn’t it be great if our kids’ internal voice was compassionate and compelled them to keep trying? With my two boys home with colds today and Easter this weekend, it was the perfect opportunity to try one of my favorite Easter themed art project with them. 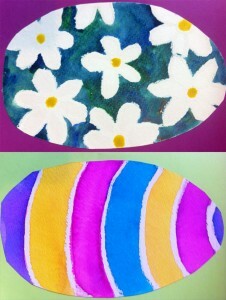 I love coloring Easter eggs so I took that concept and put it to paper to make an Easter Egg Resist painting. These paintings can be used as greeting cards, table setting decorations, or? A “resist” is a fine art technique which can easily be done with kids at home. In a resist artwork, a picture is created using a material, such as tape, or glue or, in this case, an oil pastel and then painted with a water-based material such as watercolor paint. When the paint is brushed over the oil pastels, the paint does not stick to the pastels, and it creates an interesting effect on your paper. If you have art supplies around your house, it’s likely you have a set of watercolor paints and very little guidance is necessary before your kids can dive in and create bold bright paintings or subtle delicate masterpieces with them. But like anything, the more they learn and explore different techniques, the more options they will have when they want to create specific effects- like filling in small spaces without color running around or creating a sunset in the background of their picture. This week I’m sharing some traditional watercolor techniques you can practice with your kids to get different effects, plus a few tips to care for your supplies that will make them last longer. Here’s a video from the Intermediate Program that will have your child’s watercolor repertoire expanded in no time. This set of eight colors provides rich, fade-resistant paint that goes on smoothly. The lid can be uses as a palette to mix additional colors. For more color options, look for Prang Oval Set of 16. Non-toxic and odor free. Mosaics are artworks that arrange small pieces of glass, tile, or stone to look like a picture. It’s one of the oldest traditions in art, dating back to ancient Greek and Roman times – and earlier! Elaborate mosaics were used throughout the ages to decorate the floors, walls, and ceilings of prominent buildings. This is a great art form to explore with your family, but it’s pretty hard for most of us to do an actual mosaic at home. Luckily we have a more accessible solution! 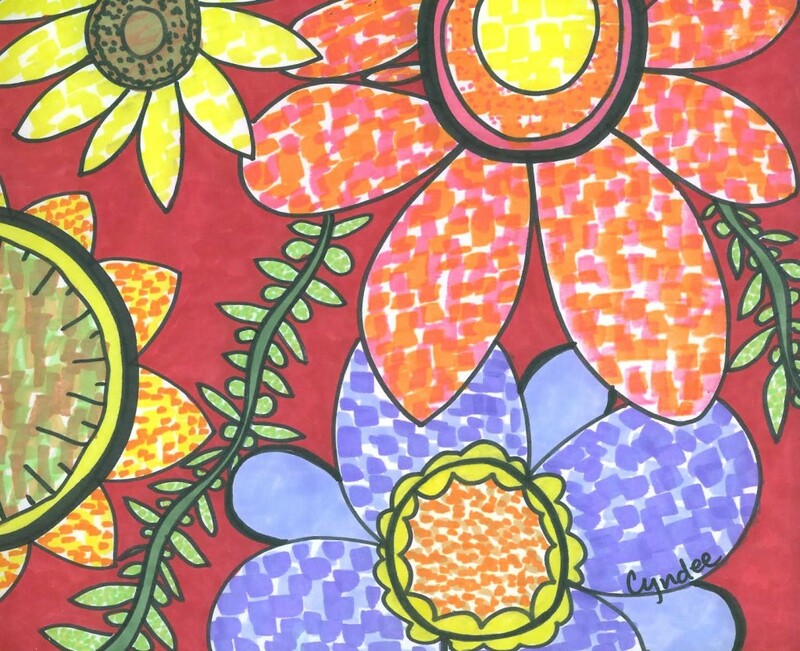 This flower mosaic drawing can introduce your kids to the idea of mosaics, using whatever basic art materials you have on hand. It’s also a playful, colorful project – perfect for adding new designs and brightening up your home this winter. 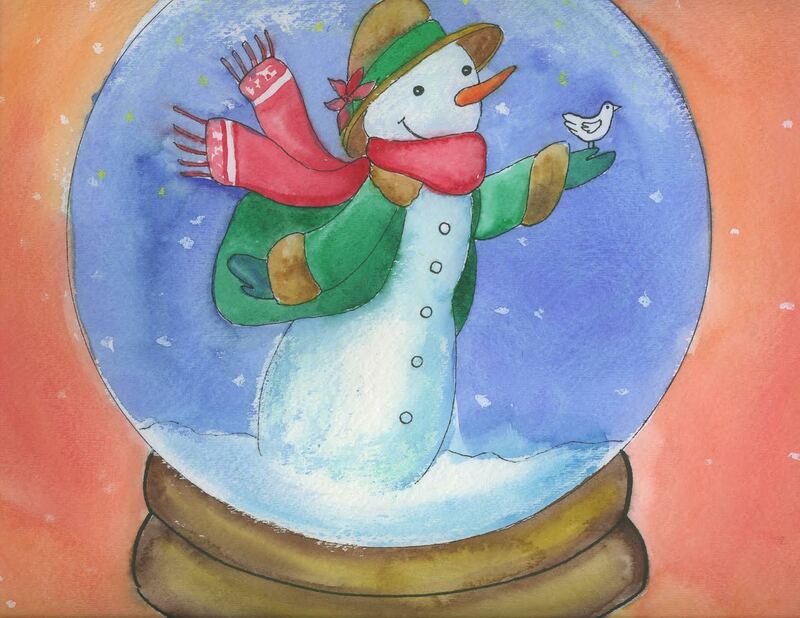 Winter Art Project- draw a snow globe! Here in the Northwest we haven’t had much snow this winter… but it’s always snowing in a snow globe! You and your kids can use this snow globe art project to build a snowman in the comfort of your own home, using paint instead of snow. It’s a great solution if snow is in short supply, as it is here – or if your family just needs a fun activity that doesn’t get everybody’s feet wet. It also introduces a bunch of useful art techniques to try, that’ll come in handy whenever your kids create new projects. Are your kids itching for some wintry, snowy fun? This penguin art project is the perfect indoor option! 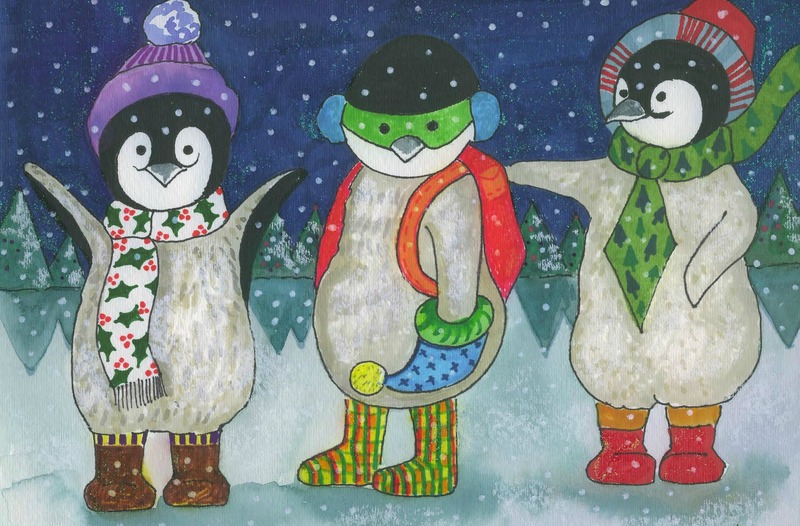 It’s a great celebration of the season, with fun winter details to add like scarves and hats. There are lots of ways to do it, so everybody in the family can find something to spark their imagination. The finished art could make a great decoration for your home, or a sweet family gift. Fall is definitely here – the leaves are turning red and orange, and we’ve all been seeing a lot of pumpkins around the neighborhood. Now’s the perfect time to try out some of those details in an art project! This fall harvest scene combines trees and pumpkins with learning a step-by-step technique for drawing a cow. There’s also lots of space for kids to add their own designs and ideas along the way. For art time with the whole family, parents can make their own project alongside the kids – see how many fun, different ways it can turn out! With the days getting shorter and that slight chill in the air, we all look for some indoor activities that can keep our kids occupied. Trying a new art project is a fun, relaxing way to engage the whole family’s creativity. This owl drawing is great for kids and adults alike, and works with whatever art materials you’ve got at home. Owls are perfect for using lots of the fall colors your kids are seeing in nature, but don’t feel stuck keeping things realistic! Tons of artists use owls as a creative design, adding their own imaginative patterns and playful, bright colors. It’s so fun to experiment with art materials! Last month I shared a video from the Intermediate Program that demonstrates some traditional watercolor techniques and I am back now with some painting ideas that really capture the unpredictability of watercolor- a quality that makes it really exciting for kids and adults alike. Artists often experiment with their art medium by adding solvents to change the consistency and they use unconventional tools to manipulate the results simply for the enjoyment of watching the process. The three techniques below do just that- using salt, straws and plastic wrap (and your watercolor supplies), you can have an afternoon of creative exploration with your kids- all with things you likely have right in your kitchen! Adding salt to a wet watercolor painting creates a starburst effect as the salt absorbs the paint. The interesting texture it creates is beautiful on its own or can be used to create a night sky or wintry scene. Thrive provides online art classes for kids. Our mission is to partner with parents to help raise creative and confident kids all over the world.